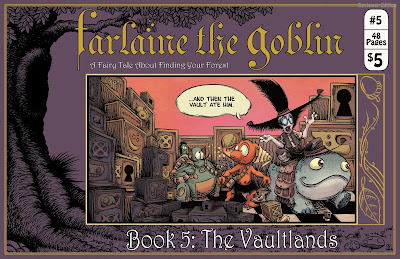 Almost a year ago I reviewed the series that stars Farlaine the Goblin (the character's name is pronounced "Far-lin"). At that time, four issues had been released - and now, at long last, our patience is reward with the fifth issue in the series. The seven-issue series follows the adventures of a clever goblin - a shaman - who has wandered the Oddlands of Wug in search of a forest to call his own. But he's quickly running out of lands to explore. Joining him in his search are the silent plant Ehrenwort and the robot named Drowsy, and together they visit the Vaultlands, a land of mystery. It's filled with an incredible variety of vaults, each one holding a different mystery - but does one hold a forest for Farlaine? I'm a sucker for this kind of puzzle / quest story, so I enjoyed the heck out of this issue - and there are some fun Easter eggs in there for those of us who have been reading comics for a while. The art is a lot of fun, very much in the Carl Barks / Jeff Smith corner of the comics world, and the story rolls right along, keeping you guessing until the end. It's great to see this series back - and the wait to the next issue promises to be a short one. Here's hoping! You can track down back issues at the website: www.farlaine.com. Highly recommended!